The following are court results for the Observer area from Hastings Magistrates’ Court from January 28 to February 3. Karl Cooper (aged 39), of Magdalen Road, Hastings, was found guilty of assaulting a woman by beating. He also pleaded guilty to resisting a police officer. The offences took place at Bexhill on November 11. The court made a community order with a requirement for 150 hours of unpaid work and fined him £50. Michael O’Connor (aged 38), of no fixed address, pleaded guilty to being in possession of heroin. The offence took place at Rothsay Road, St Leonards, in March last year. He was given a one year conditional discharge. 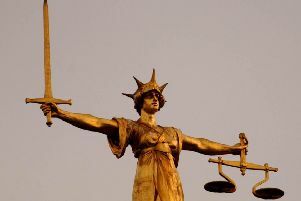 Peter Armstrong (aged 63), of Burry Road, St Leonards, pleaded guilty to being in breach of a noise abatement notice, issued by Hastings Borough Council on September 2 last year, which prohibited him from playing amplified sound and/or shouting and banging doors. He was fined £300 and ordered to pay £710 in costs. Zac James (aged 39), of High Beech, St Leonards, pleaded guilty to resisting a police officer at Hastings on November 21. He was given a one year conditional discharge. Paul Cane (aged 42), of Ilfracombe, Devon, pleaded guilty to two charges of assaulting a woman by beating. The offences too place at Bexhill in July last year. The court made a community order with a requirement of 150 hours of unpaid work and ordered him to pay £100 compensation. Magistrates also issued a restraining order. Mark Watson (aged 41), of Southwater Road, St Leonards, was jailed for 26 weeks after pleading guilty to being in possession of an axe at Warrior Square railway station on November 10. He also pleaded guilty to trespassing on railway property and three charges of causing criminal damage to cars and a charge of causing criminal damage to a vending machine. Magistrates said the reason for the sentence was that he was in possession of a dangerous weapon under the influence of drink on public property where members of the public could be. Bobby Brown (aged 31), of Albany Road, St Leonards, pleaded guilty to assaulting a woman by beating and causing damage to an i-Phone. The offences took place at Hastings on January 17. The court made a community order with a requirement to participate in a domestic abuse programme. James Clifton (aged 30), of Albany Road, St Leonards, pleaded guilty to taking a Ford dropside lorry without consent and driving it on the Green, at St Leonards, while more than three times over the drink drive limit. He also pleaded guilty to driving with no insurance or licence. The offences took place on January 14. He gave a breath alcohol reading of 116 microgrammes. The legal limit is 35mg. He was sentenced to 16 weeks in prison, suspended for two years. He was also banned from driving for 28 months. Jidhin Joseph (aged 27), of Cantelupe Road, Bexhill, pleaded guilty to driving an Audi car on Vinehall Road, Mountfield, on November 30, while disqualified from driving. He also pleaded guilty to driving without insurance. The court made a community order with a requirement of 80 hours of unpaid work and banned him from driving for 14 months. Wendy Stephens (aged 46), of Redwell Avenue, Bexhill, pleaded guilty to driving a vehicle on Watermill Close, Bexhill on January 15, while over the drink drive limit. She gave a breath alcohol reading of 63 microgrammes. The legal limit is 35mg. She was fined £375 and banned from driving for 14 months.